How can we encourage creative, entrepreneurial people in our community and attract more? Makerspaces are a popular answer, energizing communities around the nation, but what are they and how might they help the Monadnock region? These questions will be the topic of discussion at the latest Community Conversations forum Tuesday, May 13 at Bass Hall in downtown Peterborough at 7 p.m. Community Conversation is a monthly forum presented by the Monadnock Center for History and Culture and the Monadnock Ledger-Transcript. 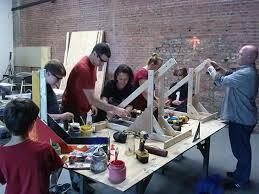 We will hear the stories of three different types of Makerspaces and discuss: What is a Makerspace? What impacts can it have on its community? What does it require to start one? What keeps it going? Those in attendance are encouraged to participate in the conversation, to pose questions and to offer their own perspectives. Attendees and all interested community members will be encouraged to participate in a survey to discover which type of Makerspace would be most appealing and how much residents might use it. Panelists include Adam Shrey, Makeit Labs, Nashua, Bryan Field, Conant High School and Erin Sweeney, The Home Press and NH Institute of Art. The program is free and open to all. Learn more about this topic by watching this Prezi. Community Conversations, a partnership between the Monadnock Center for History and Culture, and the Monadnock Ledger-Transcript, is a series that explores many of the issues impacting our communities. Community Conversations are held in Bass Hall at the Monadnock Center for History and Culture, 19 Grove St, in Peterborough. Target dates are the second Tuesday of every month, excepting July and August. The program format will vary according to topics, and may involve individual speakers, panels, or presentations, followed by moderated discussion. Community Conversations are free and the public is welcome to attend.